The morphology of anatomical brain regions can be affected by neurological disorders, including dementia and schizophrenia, to various degrees. Hence, identifying the morphological signature of a specific brain disorder can improve diagnosis and better explain how neuroanatomical changes associate with function and cognition. To capture this signature, a landmark study introduced, brain morphometricity, a global metric defined as the proportion of phenotypic variation that can be explained by brain morphology derived from structural brain MRI scans. However, this metric is limited to investigating morphological changes using low-order measurements (e.g., regional volumes) and overlooks how these changes can be related to each other (i.e., how morphological changes in region A are influenced by changes in region B). Furthermore, it is derived from a pre-defined anatomical similarity matrix using a Gaussian function, which might not be robust to outliers and constrains the locality of data to a fixed bandwidth. 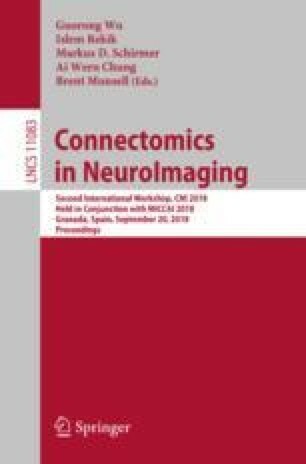 To address these limitations, we propose the intact connectional brain morphometricity (ICBM), a metric that captures the variation of connectional changes in brain morphology. In particular, we use multi-view morphological brain networks estimated from multiple cortical attributes (e.g., cortical thickness) to learn an intact space that first integrates the morphological network views into a unified space. Next, we learn a multi-view morphological similarity matrix in the intact space by adaptively assigning neighbors for each data sample based on local connectivity. The learned similarity capturing the shared traits across morphological brain network views is then used to derive our ICBM via a linear mixed effect model. Our framework shows the potential of the proposed ICBM in capturing the connectional neuroanatomical signature of brain disorders such as Autism Spectrum Disorder.